We’d love your help. 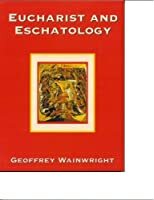 Let us know what’s wrong with this preview of Eucharist and Eschatology by Geoffrey Wainwright. To ask other readers questions about Eucharist and Eschatology, please sign up. The loss of the Eucharistic eschatological imagination is treated superbly by Wainwright. That this book has gone out of print is one the great travesties of liturgical scholarship today. It is a mode of an ecumenical, historical, liturgical theology. The school of Schmemann and Kavanagh needs to be properly balanced by the school of Wainwright. I liked this text a lot, albeit it's very dense... VERY dense. Author (British Methodist) wrote a text for the World Council of Churches about how/why the eschatological aspect of Communion (the eucharist) left, wants to restore that notion to the sacrament. Good read! A wonderful work... A must-have for anyone who is in pastoral ministry or worship planning. I really enjoy the Armenian prayers in this book. I appreciated a great deal in this. A firm blend of scriptural, theological and historical reflections.